The DA leader came close to predicting the unfortunate train delay experienced by the president. 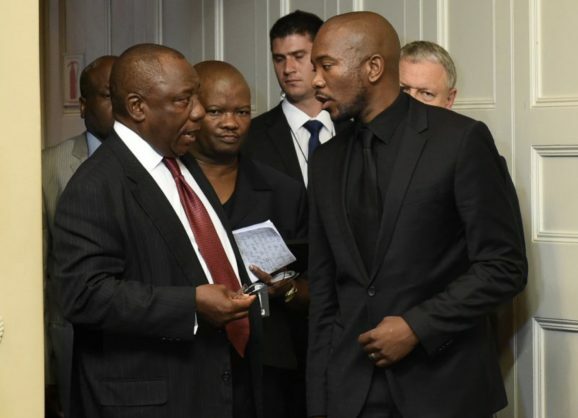 DA leader Mmusi Maimane recently wrote an opinion piece which uses as its subject the metaphor of President Cyril Ramaphosa’s train getting stuck – which is precisely what happened on Monday, as a social media user pointed out. “Turns out @MmusiMaimane’s words literally came true #TrainDelay,” he tweeted. The Citizen reported earlier on Monday that the president had fallen victim to the kind of delay regular train users are likely used to experiencing. A train from Mabopane train station to Pretoria CBD (Bosman station), carrying President Cyril Ramaphosa, a few ANC officials, and the ANC’s head of elections, Fikile Mbalula, who were campaigning for the party on Monday morning, was delayed for roughly four hours. In an opinion piece published on News24 earlier this month titled “Ramaphosa train stuck on ANC tracks,” Maimane argued that South Africa didn’t have time to wait for the ANC to resolve its factional disputes as the country and its economy needed urgent attention. By coincidence, it now seems Ramaphosa has lived out Maimane’s metaphor, as he ended up stuck on the tracks on Monday. Today President Ramaphosa got to experience what millions of South Africans face daily due to his failing ANC gov. Overcrowded, unsafe & unreliable trains that run late more often than not. The solution is simple: Dissolve Prasa & let provinces manage their own rail & ports. Ramaphosa and his party’s down-to-earth travel choice exposed him to the reality of SA train travel. The overcrowding inside the train, a reality for most commuters, appears to have dawned on Ramaphosa, who described it as a harrowing learning experience. “This is very bad,” said Ramaphosa during the delay as he interacted with the commuters to discuss some of their grievances. Maimane, meanwhile, did not miss an opportunity to turn the president’s experience into political collateral. “Today President Ramaphosa got to experience what millions of South Africans face daily due to his failing ANC [government]. Overcrowded, unsafe, and unreliable trains that run late more often than not,” Maimane tweeted. “The solution is simple: Dissolve Prasa [and] let provinces manage their own rail [and] ports,” his tweet continued.